Ted Turner has taken an unusual, Noah-like approach to saving endangered wildlife — he gives them a home in his yard. Of course, that strategy only works if you have a very, very large yard, so in Turner's case, it's a good thing he owns about two million acres of land. The billionaire media mogul has made a name for himself in his later years as a prominent philanthropist, and a huge part of his giving goes toward saving endangered species. Turner’s foundations support a variety of environmental causes, but the self-proclaimed "eco-capitalist" has probably gained the most attention in the field for his work to reestablish species on his own private land. Ted Turner has five foundations; two that deal with foreign affairs, and three focused on the environment. Through his Turner Endangered Species Fund, which is largely funded by the Turner Foundation, a team of conservationists and biologists works to protect beleaguered species. This dovetails with the fact that Turner is the second-largest private landowner in the country (formerly the largest), as these conservation efforts take place on his massive ranches across the United States. (See Turner Foundation: Grants for Animals and Wildlife). 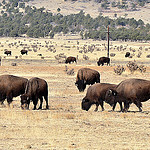 For example, Turner’s ranches are home to the "rewilding" — rebuilding their population on his expanses of undeveloped land — of two important species: the prarie dog and the bison. But these are just two examples. In New Mexico, the fund is restoring Desert bighorn sheep, Black-footed ferret and the Chiricahua leopard frog, and multiple populations of wolves. Turner's acquisition of land has been controversial and off-putting for some. For one, it raises the question of what exactly he wants it all for. Is he just pretending to be a cowboy, on a billionaire scale? Supplying food for Ted's Montana Grill? Is he truly just a devoted environmentalist? The idea of a corporate media giant sitting on his porch, watching a species he revived for entertainment, has an eerie, sci-fi feeling to it. (Read Turner Foundation director Beau Turners' IP profile). But among many conservationists, Turner is nothing short of a hero. The Fish and Wildlife Service in 2012 recognized his efforts, just as the American Fisheries Society has. Famed biologist E.O. Wilson has said of Turner, "Out of his many achievements, the most important may be the proof that capitalism and environmentalism can be joined to major humanitarian effect." See more about Ted Turner’s philanthropy here, and visit the Turner Foundation here.